The trauma of the third series were a challenge for some fans. The much talked about "rift", and the ultimate cliffhanger ending which saw Gabrielle and her evil daughter Hope plunge into a lava stream and to certain death haunted and worried fans throughout the summer. While we were assured that Gabrielle WOULD return, nevertheless it was an anxious time. The producers had been bold and taken risks in series three, taking us on a roller coaster ride with our heroes. This fourth series had a lot to live up to. The first problem was to write Gabrielle back into the show convincingly, and as I write, her resurrection has not really been properly explained. Will it be? The most charismatic villain of the series, Callisto is apparently gone for good, so a replacement foe is also likely to be needed. Then there is the eternal Joxer question. Will we have a properly written role or will he continue to be comic relief only, complete with prat falls and irritating buffoonery? US viewers (and us lucky UK fans with American friends!) have seen the first 14 episodes so far. UK satellite and cable viewers are seeing the start of this series. Lets hope its another good one. In a staggeringly ambitious opening to the new series, we get a Xena episode completely unlike any ever before. This two part story is the direct follow on from Sacrifice II. It opens with a desperate looking Xena tracking down Hades to find out where Gabrielle has gone. Rather odd as someone as good as Gabrielle would surely be a dead cert for the Elysian Fields. However, she learns that Gabrielle has gone to the Amazon land of the dead, and Xena knows that she has a difficult task ahead as she seeks to follow her. She remembers back to a time not long after she returned from Chin, when she and Borias met Alti, an ex-Amazon Shamaness with mystical powers, who showed her how to visit the land of the dead. Xena must take on the role of a shamaness to find her friend. However, she discovers that a large group of Amazons that she had killed years before have had their souls trapped by Alti in limbo, not able to cross over to the other side and rest in peace. Xena decides that she must help defeat the evil Alti. This is the cue for much spiritual chanting and dancing as this is a battle to be fought on the spiritual plane. This story is a daring and dazzling one. Shot like a big screen movie, it is almost unrecognisable as a Xena episode. Joseph Lo Duca's wonderful music is about all that is familiar. Lucy Lawless looks totally different in her shamaness outfit, and her portrayal of a desperate and slightly crazy Xena is a far cry from the usually totally in control warrior princess. There is no sign of the chakram, Argo is left to wander, no leather, no jokes, a very different set of locations and, of course, no Gabrielle. Instead we have a new set of characters, that are generally very successful. The one familiar face is Marton Csokas as Borias, who in a nicely developed role, is a slightly altered Borias. He is far less treacherous than he was in The Debt, and has a hard job keeping Xena civilized when we meet him again in the flashback sequences. Xena also meets a group of young and rather rootless Amazons- the remnants of the tribe she helped to kill off. They are ignorant of many Amazon customs, and look up to Xena as they help her. My favourite new character is the mysterious and deadly shamaness Alti. I loved Claire Stansfield's character. Very tall and hypnotically sinister, she is one of the very few actors who has made me watch her rather than Lucy Lawless in their shared scenes. Her character's influence over Xena is a terrible one. Indeed , AITST part 2 has Xena committing one of the most barbarous acts we have seen yet. A large scale and brutal series of killings for the sole purpose of gaining a power promised by Alti, the evil Xena truly was a monster. Part One sets the scene for the forthcoming spiritual battle. It features my favourite scene from the story, a very emotional one as Xena grieves for Gabrielle as she gives a young dead Amazon a funeral fire. Maybe it was the fire that did it, or just the rites of death, but Lawless is outstandingly good as Xena grieves for her friend. I also liked the scenes between Xena and Borias a lot in this story. Borias is more of a businessman than anything here, without the treacherous side we saw before. He is falling in love with Xena and when he learns she is pregnant with their child he is concerned to protect it. We also see him rescue a young girl orphaned in one of their raids. A child that grows up to become the leader of the young Amazons that Xena meets. Xena, on the other hand, is as power hungry as ever. Clearly facinated by Alti, she falls under her influence with violent consequences. One of the unexplained little mysteries of this story is the young apprentice Anokin that Alti brings with her. She is young, pretty and blonde and Alti seems to offer her to Xena. Then the next time we see her, Xena is crying over her dead body, clearly very upset. Indeed, she makes her first trip to the Amazon land of the dead to see her, where Anokin rebuffs her, claiming Xena poisoned her soul. What is the story with Xena and Anokin? Will we ever know or is it another of the producers little teases? Another odd moment from this episode is after Xena fights the Berserker, and is discussing the power Alti has to make you remember past battles. "This power she has..it's a toughie," was a line many fans found rather wierd sounding. A Kiwi-ism by Lawless? An attempt at humour? Whatever, I loved this episode. So different, but a real epic in the style of The Debt. I got the chance to see it on a big screen at a Xenafest, and this is one that REALLY benefits by being seen like that. Containing almost none of the elements that made the show popular, this ambitious episode begins an important season well. One of the characters who created a lot of interest before this series began was the character of Cyane, the queen of the Amazons- a different tribe to Gabrielle and Ephiny's mind you. While we met her in part one, it is the second part is Sin Trade where we get to know Cyane a little better. Super-buff, as played by body builder Vicky Pratt, it wasn't long before the producers had her stripped off in the steam hut- pleasing many fans! This second part tells of Xena and Borias' meeting with the Amazons. Borias is planning a treaty, but Alti has plans for Xena and her to interact with them in a different way. Cyane offers Xena a chance to join them, and bests Alti in a battle of wills. Will Xena take her up on the offer to become an Amazon? Meanwhile, back in the present, Xena and the young Amazons approach the place where their spiritual battle with Alti must take place. The cunning Alti can occupy the body of any living creature and in a really icky scene, a very large spider crawls over Xena's face before Gabrielle's head appears on it calling to Xena, and then Alti appears. Alti demands to know who this blonde person is, and Xena realises that Gabrielle could be the key. 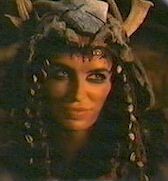 The source of Alti's power is revealed by Xena when she explains how she slaughtered all of the leaders of the Amazon tribe, just because Alti asked her to, and promised her the chance to become the destroyer of nations if she did. Cyane and co become more of Xena's victims, brutally killed by the cocky warrior princess in a disturbing scene. The episode reaches a climax as Xena uses the spirits of the young Amazons to strengthen her as she fights Alti on the spirit plane. Alti tried to disrupt Xena by showing her scenes from her future, including one that has her and Gabrielle being crucified. Rather than breaking Xena's will, this rejuvenates her. If Gabrielle is dying in their future, she must be alive now! The power of love is the thing that can beat Alti, and with that Xena defeats the evil shamaness, before leaving her new friends to continue her search for Gabrielle. While not quite as coherant as part one, this episode features THAT scene, the crucifixion, that has caught the imagination of the fans. We see a short haired Gabrielle and Renee O'Connor's recent haircut has fans worried. Director TJ Scott clearly likes fancy camera moves. He directed the dizzying Girls Just Wanna Have Fun, and the fight between Xena and Alti is another swirling and rather confusing scene. To be honest, I found all the spirit plane staff a bit unclear. I had to watch about 4 times before I really understood what was happening. Stylish and good looking as this episode is, the story telling side must not be neglected. The other scene that sticks in the mind is the one where Xena kills all of the Amazon leaders. I would like to think that it is Alti's influence as this is probably about the worst thing we have seen Xena do. She kills brutally and without mercy, and the worst thing of all is her attitude. She does it so casually, just leaning against a tree expresionless as Alti collects Cyane's blood after she is skewered by a branch. Yuk. To kill in anger, or revenge, or in battle is one thing, but Cyane offered Xena friendship and was murdered for convenience. My view is that Alti had Xena so much under her spell, that Xena would do anything she asked. She also offered Xena something she very much wanted. Power like Lao Ma had, that would make her almost invincible. Of course we don't know quite what power Xena DID get and whether Alti was just using her, or whether it was just the confidence to think she was unbeatable that she gained. Adventures in the Sin Trade was a great start to the series, but also a rather odd one. To put Xena is a completely unfamiliar enviroment, with new people and a powerful but intangible force to fight against meant that this story did not satisfy all fans. Also, many of us were hoping Gabrielle would return in part two. Renee O'Connor's name was missing from the credits and she only appeared in those flashback sequences. Considering the story was about getting her back, it was a bit disappointing to have to wait. Yet again we saw someone who was willing to help Xena and be a friend to her- considering her ten winters ago character that is some feat. I was a little disappointed with the Cyane character. I didn't find her that interesting or that memorable. The episode looked great. As I said at the beginning, it was filmed like a movie, and the stunning New Zealand locations were wonderful. However, I think that the story did get a bit confusing in part two. Now the big question is how WILL Gabrielle return??? A Family Affair sees the return of Renee O'Connor as Xena travel back to Gabrielle's home town of Poteidaia. The episode opens with Xena back at the temple where Gabrielle and Hope fell in Sacrifice II. On arriving in Poteidaia, they meet Gabrielle in the market place and go back to her home where her family are not that pleased to see Xena. However, a monster has been attacking sheep in the area and after a man is killed, Xena tries to kill it. One encounter is enough for her to realise that it is the Destroyer, son of Hope. She also realises that the girl who they thought was Gabrielle is Hope! While her exact motives are unclear, Xena knows that she must be stopped. The real Gabrielle also turns up for a touching reunion with her friend and the pair work on a plan to stop Hope and her son the Destroyer while ensuring Gabrielle's family are safe. This episode is filmed like a low budget horror film, a lot of shots of a tattered windmill turning, swinging gates on creaky hinges, thunder and lightning, and a rather ridiculous man in a giant hedgehog suit as the Destroyer. However,it is wonderful to have Renee O'Connor back, and she has got better and better at playing the evil Hope. There is a great scene between Hope and Gabrielle that she does really well. Rather poorer is the explanation of how Gabrielle survived. In fact it is so lame I can't believe the producers didn't think of something better. Maybe they will return to it to resolve the story properly. I was also disappointed in the portrayal of Gabrielle's mother- a different actress from the one in Sins of the Past, and ex-Prisoner Cell Block H star Lisa Crittenden gets possibly the worst role a guest star has ever had! A really drippy and stereotyped "Mom" role. Joxer appears, but is used well, thankfully. I think it is when he is an unneccessary character that he is annoying. When Joxer has a purpose, he is fine. I loved the assignment Xena gave him- calculating the flocks ie counting sheep! Joxer haters must have been steaming when he leapt in fromt of Xena to give Gabrielle a hug at the start, but as that was really Hope, I trust they recovered. The actual reunion scene was beautifully done by both actresses. A shell shocked Gabrielle and an emotional Xena meet in the woods, but surely Xena would want a better explanation that the one Gabrielle gave? The confrontation with the Destroyer was the climax of the episode, and despite the silly looking monster, it was quite nicely done. You have to wonder at the appearance of the Destroyer. Hope and Ares are his parents, he is supposed to be further evidence of the power of Dahak, yet he is more like a prickly Chewbacca! Have we really seen the last of Hope and the Destoyer? Hope has been the Captain Scarlett of XWP- definitely indestructible! Her demise this time was not one that looked impossible to return from, and is Xena's sword enough to kill the Destroyer? A pretty good episode but with that poor explanation of Gabrielle's survival and the unconvincing monster not an absolute classic, however, an overdue return for Renee O'Connor. This is one of the episodes that divides fans more than most. It really is a love it or hate it one, as we get possibly the most disgustingly gross comedy ever- possibly a response to the hit film There's Something About Mary. Xena and Gabrielle are not too well. Xena has lice and Gabrielle has foot rot. After a taste of Joxer's cooking we also have stomach upsets and vomiting too. Xena is looking for Argo who, if you remember the start of Sin Trade I, she left to wander while she went searching for Gabrielle. Also, an army of Scythians are threatening a town who foolishly hired Joxer to help. Naturally he needs Xena and Gabrielle's help. To complicate things, Argo is seen, but she seems to be ignoring Xena, and is tamed by the Scythian leader. Xena must save the town , but more importantly get her horse back! For the most part, I found this episode hilarious. I loved the little lice sound effects. Each time Xena scratched, we heard the sound of a lice party going on! I liked the Argo/Xena rift story- this was about the best Argo episode we have had since The Greater Good. What a horse! There is also the fun of another bath scene and Gabrielle vomiting on Joxer. Renee O'Connor once again displays her comic skills throughout, although Lucy Lawless seemed a touch over the top at times. In a promising development for the series, Joxer was well used once again both as a comic foil and eventual hero. We get Gabrielle's version of the pinch interrogation which involves her drooling on her victim and even a South Park homage if you listne carefully. Guest stars : Karl Urban(Caesar), Jeremy Callaghan(Pompey), Stephan Lovatt (Phlanagus). In a return to the more traditional Xena episode, we meet Julius Caesar and Pompey once again, as the Romans bring thier battle to Greece. A Greek man in the Roman army, Phlanagus tries to protect his home village from a troop of soldiers, and once Xena joins in the fight, she learns that Caesar and Pompey's armies are fighting each other on Greek soil. She wants to save the villagers and defeat the armies, and comes up with a plan that will involve Gabrielle becoming directly involved in a battle. Can she lead men to war? Meanwhile Xena has Caesar and Pompey separated from their troops and must keep them away while the battle rages. Back to the more traditional Xena episode, and a very well done one. We see Gabrielle's development once again as she becomes a highly unlikely commander of a troop of soldiers. Mind you the leather sort of suits her! It is also interesting to see Gabrielle with the young man who kills for the first time here- she can fully empathise, and Renee O'Connor is very impressive once again as the not so innocent any more Gabrielle. I am not a huge fan of the Roman stories, and of Karl Urban. 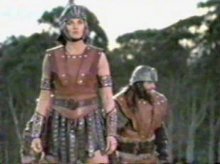 However, these battle scenes were pretty good- although you would think the highly trained Roman army would be a bit more efficient, even with Xena's tricks. The main problem I had with this episode is that I- unlike many fans who loved it- just couldn't get involved in this episode. While I admired it, I didn't really like it all that much. Why DID the Romans bring their battle to Greece? Was it really necessary to burn the village? Why didn't Xena just kill Caesar and Pompey- apart for Historical reasons of course. However, I did like Xena outwitting the great generals, and I also liked the way she recognised Gabrielle's ability to lead. Can you imagine the young refugee from Little House on the Prairie doing that? Gabrielle's dilemma when Phlanagus is under threat was also intriguing. We see her hurling a spear for the first time, but missing hopelessly. Was she a bad shot, did she miss on purpose or what? The scenes between Gabrielle and Xena afterwards were slightly strange. Xena is more blunt and less reassuring than before- she doesn't say 'there, there, everything is going to be alright', which is a further sign of Xena's acknowledgement of Gabrielle's role I suppose. I did particularly like the final funeral pyre scene- one of the most beautifully photgraphed shots we have seen, using a lovely lakeside setting. Now is it me, or are there a few new locations this series? Maybe that well used castle/village set has been redesigned or something. I also think special mention should be made of the lady playing Phlanagus' wife, who scandalously can only be named by examining the end credits(which I haven't done!). Here was another wonderful strong female character, as this series has so often given. The actress did well too, and made a strong impression as a determined woman who was prepared to suffer to help her family and her village. I am probably in the minority in finding it strangely uninvolving, but undoubtedly, this was a well made episode, with good acting, and lots of leather and helmets! Now I am sorry, but this is about THE most disappointing episode for a long time in my opinion. I don't want to be a moaner, but this episode wasted the talents of the cast and directer with a weak and silly story, a ridiculous villain and further lack of consistancy in the portrayal of Xena and Gabrielle. It also had that HORRID, HORRID Tara back! Yuk! The story has Xena and Gabrielle enter a town to discover a young girl being whipped, and it is Tara. After saving her by agreeing to take her away with them, they do a sudden about face and decide to turn the town's attitudes around. In this town dancing is a crime. To complete thir task they enlist the help of Autolycus, disguised as an American style TV Evangelist, while Xena pretends to train the youngsters in battle drills- but they dance. A terribly weak subplot about assassinating rivals, leads to one of those, "let's all dance" finales that is supposed to be a homage to the crappy movie Footloose. It includes Gabrielle inventing Riverdance well before Michael Flatley, Xena and Autolycus going wild too. Again, I know of some people who just sat back and enjoyed this one, but I found little to enjoy in this episode. Let's be positive though. There is a really fab song- hopefully one that might make the next CD, that Tara and her insipid boyfriend dance to. Autolycus is funny as usual, and we get the facinating information that Xena contacts him by pigeon! The dance sequences are fun if you like that sort of thing. Renee O'Connor looks a little more competant than Lucy Lawless, and they look as if thay had a good time. There is a nice little scene when Xena and Gabrielle are going to bed on thier arrival. Xena has a stomach ailment for some reason- unexplained. However, Gabrielle is in the mood to dance and Renee O'Connor is delightfully comic as she wriggles around. On the debit side, Tara is just as irritating as she was in Forgiven. The guest stars were particularly poor this week. Drippy boyfriend I mentioned. His far too young looking father was a little better, but the head baddie was like something out of a cartoon. Maybe that is down to director Michael Hurst, and the Godawful costume that made him look like a walking condom! The inconsistencies in character are more annoying. Gabrielle is all agressive, yelling, 'save some for me', while Xena is beating up baddies, and she is very irritable with a cobbler who mends her boots too for no reason. Xena has changed in many ways over the years, but to me, the dancing was not in character, and Lucy Lawless' enthusiasm looked too much like Lucy than Xena. The whole story was just weak and poorly though out in my view. Still, one consolation is that Tara should be gone for good now. Xena goes to prison. Yep, her past crimes finally catch up with her(only now?) when she is put on trial for murder based on slightly dodgy evidence- have they never heard of habeus corpus? No, they wouldn't that is Latin after all. The episode opens with another tease as we see Xena getting a back rub from Gabrielle, but the fun doesn't last as soon Xena is in chains and Gabrielle is doing her Perry Mason bit again, trying to defend her friend. 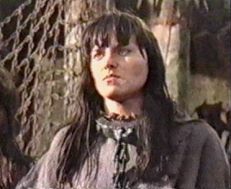 As in The Reckoning, she fails(don't take up the law Gab), and Xena is sentences to life on Shark Island Prison- the original title of thie episode. Once there, we get all those movie prison cliches. Sadistic guards, cruelty, bullying etc etc. The head guard is a dead ringer for Donald Pleasance. Meanwhile, Gabrielle cons her way in as the new healer and realises that the boss of the prison is the woman Xena was supposed to have murdered! We get another glimpse of nasty Xena, although it is not too east to work out whether this is the Destoyer of Nations or just the pirate. The costume is post Cirra(from Armaggedon Now), but she seems fairly reasonable, and even loks shocked that the girl, Thelassa was dead. Supposed eaten by flesh eating crabs! What is odd is Xena's attitude. She has plenty of reason to feel guilt if we believe all that we have learnt over the past few years of her past misdeeds. Yet it is this crime, a fairly tame one compared to some of the bloodthirsty acts that we have seen her commit. What is special about the young Thelassa is that she acts almost exactly as Gabrielle did in Sins of the Past. She volunteers to sacrifice herself to save her village- just as Gab did to the slavers. Maybe it is this parallel that makes Xena so resigned to her fate. The prison scenes are rather tedious and predictable, and the supposed rival inmate is a real wimp. One little fight and she is backing down. Of more interest is Gabrielle's transformation to a sort of new age healer. The outfit is very fetching, and Gabrielle has a nice scene with the scarred and crippled Thelassa. However, she is another character whose motives are less than clear. Did Xena's treatment of her REALLY change an sweet natured girl like her to that extent that for all these years she has been so bitter? If so, then Gabrielle really does work miracles as she shows signs of softening after one session with healer Gab. The climactic scenes are again a bit daft. Xena is in amongst the rats - again, and after Gabrielle tries to save her, she is due to be hanged, however Xena escapes from the chokey just in time for a huge punch up. Lucy has had a few nasty creatures to cope with- spiders and rats this season already. The scenes in the dungeon with the rats is about the best for her expressions and a suitable improbably rat toss using her teeth!